What are Adjectives? How are Adjectives Taught? Adjectives are taught as early as grade 2 and for many grades beyond that. Adjectives are one of the parts of speech. An easy way to remember adjectives is to think of them as describing words, words that describe people, places, things, and feelings. The Adjective Bag: Fill a plastic bag full of sensory items (cotton, putty, chalk, string, putty...) and take turns describing what the items feel like. Record this on chart paper or in notebooks. Taste Tests: Using 10 or so paper plates, put different foods on each plate, enough pieces for each child to try (celery, smarties, parsnips, licorice, rice cracker etc.) For each paper plate item, place a pencil and notepaper to allow each student to print an adjective about each item tasted. Students should be encouraged to print describing words about taste and / or texture. My Family: Students make a list of their family members, under each member they will print describing words about their personality and looks. Circle of Students: The students stand in a circle, the teacher or selected student begins by describing the person next to them with an adjective. For instance, student A says polite, the student who was described as polite says a word about the student beside them.....athletic, pleasant, nice, smart, funny, until the students run out of ideas. Scavenger Hunt: The students go through newspapers and magazines to record as many adjectives as they can within a specific time period. Nature Walk for Adjectives: Students take their clip boards and notebooks/pencils outside. They print the noun with an adjective or 2. For instance: sky - cloudy, temperature - warm, grass - wilted, bug - ugly. Come in after the nature walk and share as a group all the adjectives they came up with on the nature walk. Adjectives in the Class: Much similar to the nature walk, students take 15 minutes to come up with nouns from the classroom and adjectives. For instance - books - many, chalkboard - dusty, chairs - brown, blocks - broken. Partner Brainstorm: Students work in pairs. One student states a noun and the partner students provides the adjective and then they trade after 10. For instance, partner 1 says apple, partner 2 says red, partner 1 says teacher, partner 2 says nice. Adjective Centres: Have a music centre where the students listen and describe the music, have centre with a variety of pictures of landscapes and have students describe them, have a center with a variety of movie titles and have students describe the movie and the characters, have a centre with pictures of cartoon characters and have students describe them. If you have other great ideas for helping with adjectives, please share. 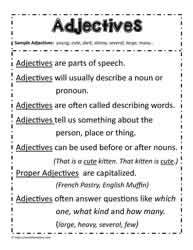 And be sure to check out all the adjective worksheets here.